For the longest time, I have wanted to go back to black. Everytime I go to my favorite local korean salon, the assistants discourage me from doing so because they say that once I dye it back to black, it would be hard for me to dye it to a lighter color so I always end up getting my hair done in dark brown and last time, I dyed it with Palty's Bitter Cappuccino. Sadly, the color does lighten after a few weeks especially if you tend to wash your hair everyday like I do. Moreover, during our corporate Christmas party, I notice almost every girl had suddenly wanted to dye or dyed their hair to light colors. I once thought that dyeing hair to a lighter color would make me stand out but then since everyone is going blonde or brunette, I think it's time to be one step ahead and dye my hair into a cooler tone. It also helps that I read from a magazine that cool colors and matte hair are "in" this coming season. And so, last Friday, I went back to the salon and have it dyed to Blue Black. I am very happy with the result. However, the big problem I have nowadasy is that I tend to have reddish skin because I have been having bouts of allergy attack ever since Christmas. My eyes often look itchy and tired and my nose red from pinching and blowing. 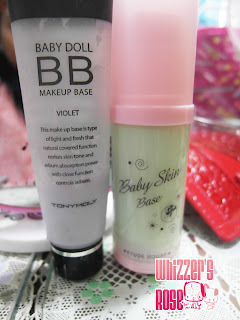 Red Skin totally doesn't match Blue Black hair so instead of using my usual Tony Moly Baby Doll BB Primer in Violet, I have been using Etude's Baby Skin Base in Green. I have been looking for color correctors everywhere but I cannot find any, I saw one once but I can't remember where. So for nice color correcting primers would do. 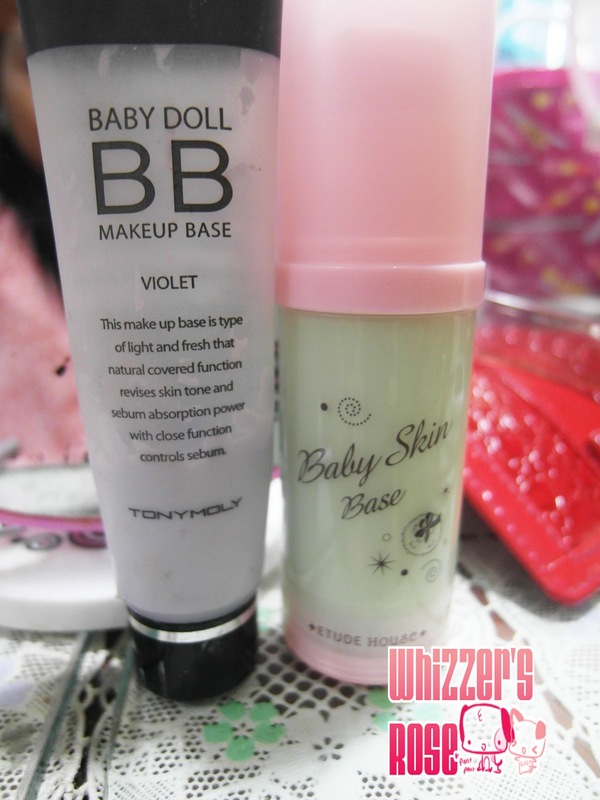 This is Tony Moly's Baby Doll Primer BB primer in Violet (my current favorite) miexed with Laneige Snow BB Cream in No. 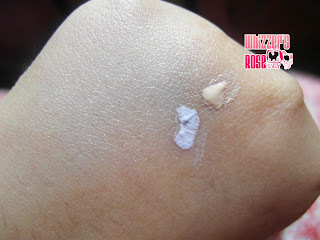 1-left side is the blended area while right side's bare. 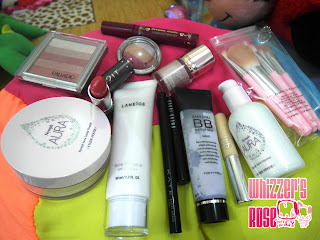 Currently, using Etude's Baby Skin base in Green to neutralize my red skin caused by allergy. The usual stuff I use these days, The Nymph Aura Loose Powder and BB Volumizer are Christmas gifts from my sister. I asked for a loose powder but this powder gives me a pink glow that doesn't really go well with Blue Hair in my opinion and it's a tad too pink for a finishing powder so you can use this one as a blush on if you want that subtle glow on your cheeks. About the volumizer, I don't really like the texture of the substance because it's kinda slimy when you apply it on your face. 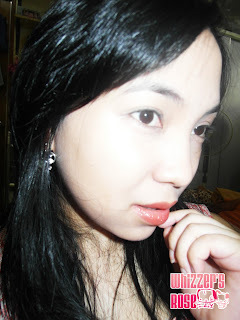 I saw this one from a guru that I follow on youtube where she did her "flawless Korean face" tutorial ala Song Hye Kyo and I thought I must try it but it's not something I would buy again. In my opinion, Faceshop's FlowerPod Primer in Pearl's (sadly was discontinued)still one of the best ones I've tried to get that glowing flawless Korean face.